Our windows and doors are in!!! (Catch up, here). One of the biggest decisions yet and one of the scariest. You guys were so helpful weighing in on if we should go with the black iron look or the white more traditional look. THANK YOU! Before I show you what we picked in the house (!!!) - let's talk next steps. Come on sheetrock! Up next is brickwork, and I am learning a whole lot more about brick laying than I would like. It snowed for the second time and you can't lay brick in the rain....snow....cold... Can we talk about this Atlanta weather?!? Who knew Atlanta would choose this year to actually have a winter. Fingers crossed the snow clears soon, and we can get moving! From screen porch to breakfast room...and now - meet our future family room. This room is right off the kitchen and our main living space. I can't wait to spend time in this bright room. The TV a big couch and all. With all of these windows, I want to make this room really comfy with a lot of textiles and fabrics. The mix of rich colors and patterns in this design from Jayme Armour is giving me a lot of ideas. I love that her focus of the room was to be a "Get Low Room," ha! with pillows that are meant to be on the floor. The kitchen window is gorgeous! The wood is mahogany, and I am seriously considering staining it because it may be too pretty to cover up with paint. It's a true french encasement window, so it cranks out. I am going to think about how to work the black hardware into the design scheme! The design for the kitchen is giving me heartburn. I have been set on a white kitchen with some pops of colors I can change out as styles change, but MAN a blue kitchen!!! 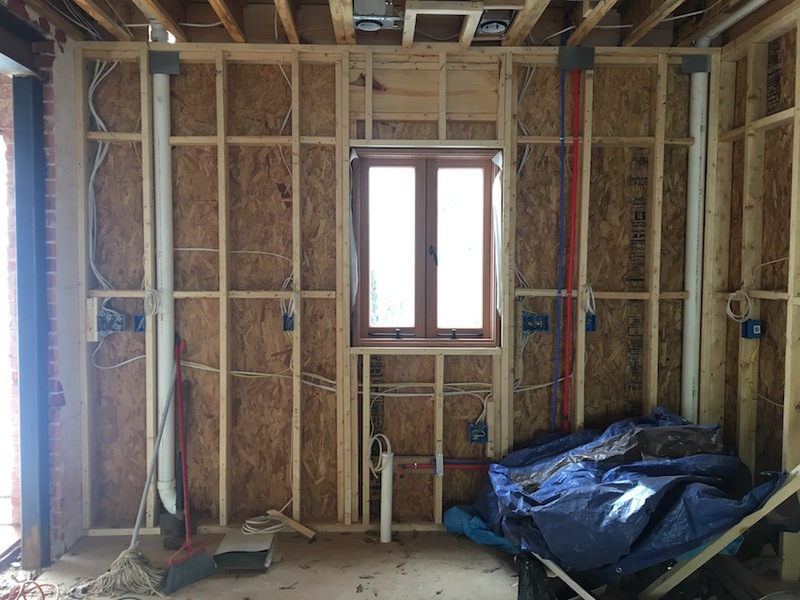 This is the biggest open space in the house and I really can't wait to see the double doors open to the porch and the sheetrock up! 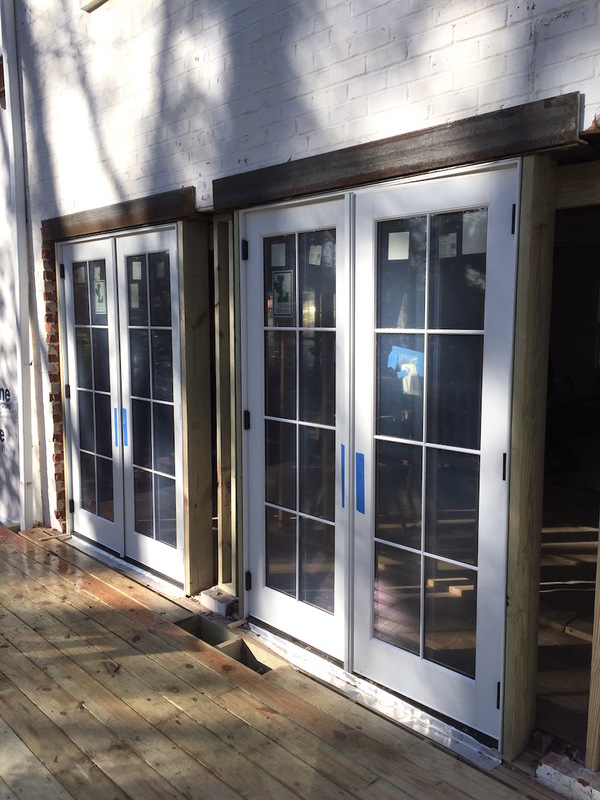 I am really happy with how the double french doors turned out. A lot of people have been talking about "The New Traditional" as one of this year's design trends. I LOVE this because I feel like the mix of old and new and traditional and modern is my favorite look. I originally designed our old living room now three years ago and I'm excited to mix up the look. With the new layout, I am on the look out for a new pair of couches and a new rug. I'm loving the idea of couches that don't have to match. 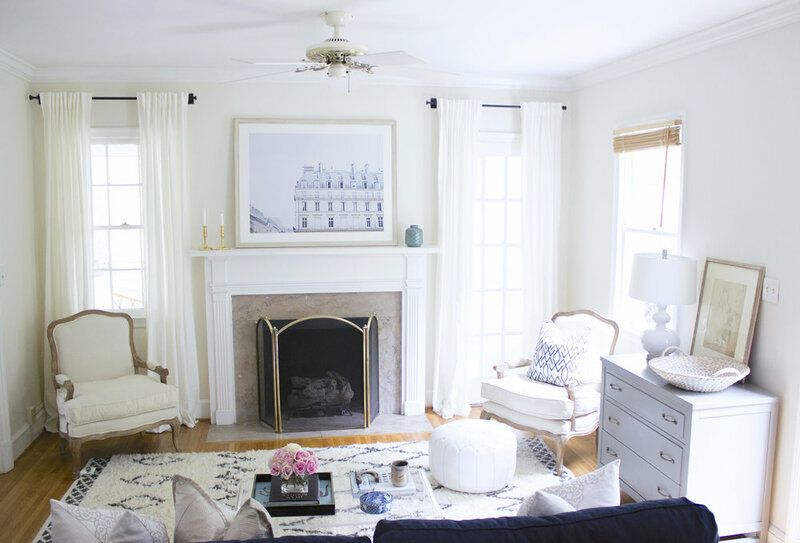 I'll be sharing more home renovation updates next Wednesday!